Papaya is a large, tree-like plant with a single stem growing from 5 to 10 m (16 to 33 ft) tall, with spirally arranged leaves confined to the top of the trunk. 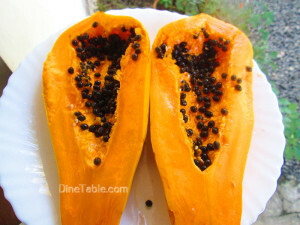 Papaya was reputably called the “fruit of the angels” by Christopher Columbus. Botanical name of papaya is Carica Papaya. Their flesh is a rich orange colour with either yellow or pink hues. Inside the inner cavity of the fruit are black, round seeds encased in a gelatinous-like substance. 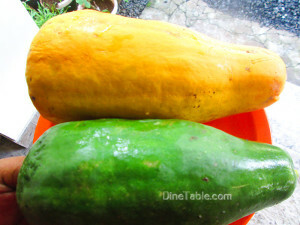 This exotic fruit also popular as pawpaw, is packed with numerous health benefiting nutrients. It is one of the favourites of fruit lovers for its nutritional, digestive and medicinal properties. Papayas contain an enzyme called Papain that aids in digestion and can also be used as a meat tenderizer. Papaya is also high in fiber and water content, both of which help to prevent constipation and promote regularity and a healthy digestive tract. Papaya is a rich source of antioxidants, phytonutrients and flavonoids that prevent your cells from undergoing free radical damage. Papaya helps to protect against Prostate Cancer and Colon Cancer growth. As it has anti-proliferative effect on liver cancer cells, it stops or slows down the growth of the cancer cells of liver and helps in its cure. Studies have shown that Type 1 Diabetics who consume high-fiber diets have lower blood glucose levels and Type 2 Diabetics may have improved blood sugar, lipids and insulin levels. One medium papaya provides about 4.7 grams of fiber. The risks for developing Asthma are lower in people who consume a high amount of beta-carotene, contained in foods like Papaya, Apricots, Broccoli, Cantaloupe, Pumpkin and Carrots. Eating papayas are good for your bones as they have anti-inflammatory properties along with vitamin C which helps in keeping various forms of Arthritis at bay. It contains anti-inflammatory enzymes that help in relieving pain for those who are suffering from Arthritis, Edema and Osteoporosis. The fiber, potassium and vitamin content in papaya all help to ward off heart disease. An increase in potassium intake along with a decrease in sodium intake is the most important dietary change that a person can make to reduce their risk of Cardiovascular Disease. As it is a fruit that is rich in fiber it lowers blood cholesterol levels. It contains enzymes that help prevent oxidization of cholesterol, which in return helps to prevent heart-attacks. Researchers have found that the juice obtained from the papaya leaves helps in the dengue fever treatment. The extract obtained from the papaya leaf increases the platelet count also known as thrombocytes in patients with dengue fever. In poison related kidney disorder it was found that the aqueous seed extract of the unripe mature fruits of papaya induces antioxidant and oxidative free radical scavenging and help kidney to recover. 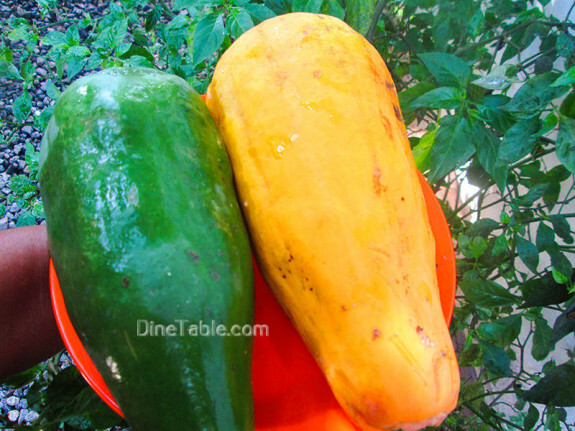 Papaya is low in calories and high in nutritional values. Hence, it is good food for those who want to lose some weight. The fibre content in papaya makes you feeling full and also clears your bowel movement making your weight loss regime easier. It helps to get rid of acne and skin infections as it helps to open clogged pores. The fermented flesh of papaya also called as papain helps to dissolve the dead cells, giving fresh and glowing skin as a result. It is good to cure the skin infections and wounds that don’t heal quickly. Shampoos containing papaya are very good to control dandruff. Vitamin A in them is utilised in production of sebum, a compound that is crucial for keeping the hair smooth, shiny and moisturised. The antioxidants in papaya help in controlling premature ageing. 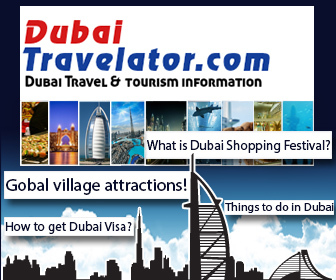 This quality of the papaya helps you to get a younger look. Papaya is rich in vitamin C, vitamin E and antioxidants like beta-carotene which helps prevent your skin from free radical damage keeping wrinkles and other signs of ageing at bay. Papayas are rich in Vitamin A and flavonoids like beta-carotene, zeaxanthin, cyptoxanthin and lutein which keep the mucus membranes in the eyes healthy, preventing them from damage. Nobody wants to lose their ability to see due to diseases like age-related macular degeneration, and eating papayas will ensure that you do not see a day where you cannot see.